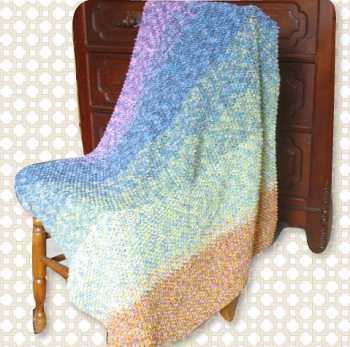 Soft, warm and cuddly baby blanket in a cascade of progressive colors. This blanket would keep baby warm and comfortable, and brighten up the nursery. The blanket is of ample size so it can be used for a while before baby outgrows it. It would also make a nice lapghan. *Note: This pattern uses yarns that have been discontinued. May be substituted with yarn of similar gauge. With A & A1 held together, CO 95 st.
Work in Pattern Stitch till you have used up A. Join B to A. When you have used up A1, join B1 to A1. Continue in Pattern Stitch, joining yarns in alphabetical order, ie. A, then B, then C, then D, then E.
Likewise, join A1, then B1, then C1, then D1. Make sure that as you work towards the end of E that you have sufficient yarn left to bind off all stitches in pattern.